Geoff is a Welsh artist who works from his countryside home studio near Malpas on the Cheshire border. A self-taught artist, he grew up on a local farm before gaining a degree in Maths & Stats. He then switched his attention to his artwork and has since made a living from painting. 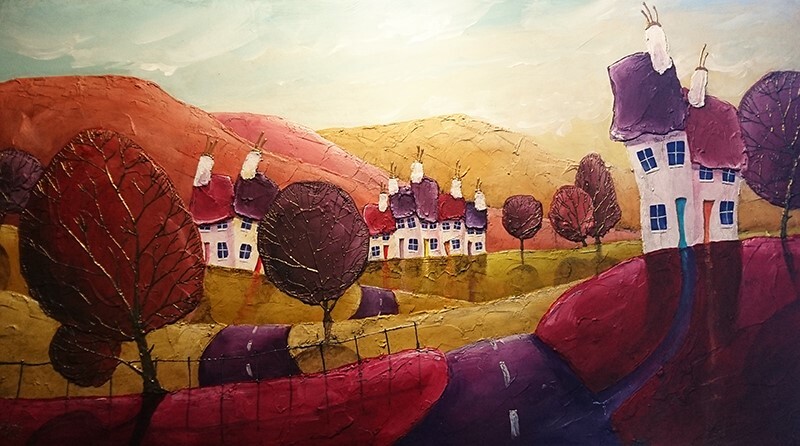 Geoff is known for his quirky paintings that involve layers of texture and colour with a thick resin finish. Geoff paints using lots of texture – heavy body acrylic paints, texture gels and more, often 5 or more different medium on every painting. All this work is then covered in a layer of resin that can be up to a quarter of an inch thick. Only the highest parts of the texture work protrudes from the surface, and all other texture work gets submerged – still giving shadows and depth but from within the resin. All resin used is top quality artists resin that is resistant to both UV and yellowing. It is very durable and tough however can be scratched – to clean any dust from resin treat it like glass and use a gentle glass cleaning product with a soft lint free cloth.